Thai Swan (Hong): The swan sculpture or 'Hong' in Thai, created by skillful of Thai artist. The belief of Thai people about Swan is the Hong is the symbol of love and immortality. "The Hong (also called Hamsa, sometimes spelled Hongse) is the mythical Ganter, linking the ocean with the sun and the sky. He is the mount of Varuna and Brahma. He represents the breath, the foundation of our existence, and serves as a guardian of the sky. In the temples of the Sun in Northern Thailand, he is often seen. They believe that Hong carries the soul of the temple-builder of the sky. Due to the natural origin of the material, please expect slight differences. 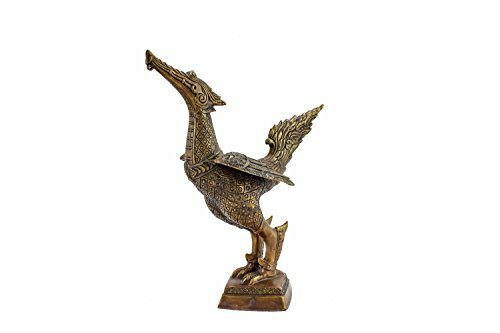 Buddhist swan bronze statue depicting legendary Thai bird. Hong is one of the creatures that is believed to live in the Himavanta. Bring blessings and luck to your home.